Highly experienced in developing custom IoT solution for various industries as per business needs. We can easily adapt your existing Android app to the TV platform and make it look great on large screens. Or why not to develop a brand new one? Just let us know what your needs are and we will deliver. Loop: "The Loop App connects to the Wi-Fi display and allows you to seamlessly share video, photos & video chat with your friends and family THE SCOPE OF THE PROJECT iOS App Development, Display Developm..."
Lynkd: "An Application for a IOT Device. The LYNKD application allows a user to connect to a LYNKD enabled device via Bluetooth. With LYNKD a user can access, configure, enable communication services like WiF..."
We do have a good exposure in IOT, also have launched app successfully with client satisfaction and retention. The Synergo Group Android TV development team develops state of the art Android TV apps as well as other TV platforms apps. Our IoT-as-a-service enables organizations to transform business needs into competitive differentiators by delivering innovative IoT solutions. From Beacons, Coffee Makers to Refrigerators, we have done it all. We offer qualified Android TV development to our customers. Our team of experts is able to develop Android TV apps on budget and on time, meeting you requirements easily. IoT, short for Internet Of Things, revolves around the idea that a network doesn’t only connect people but everything around them. These means that all devices are able to connect and exchange data with one another through the Internet. Appliances, vehicles and any other type of device will be able to connect and exchange information with other devices. In order to do that, these devices need to be controlled by a software, an app that will process the data to be exchanged in a useful way. The concept of IoT has been around for decades with a Coke machine at Carnegie Mellon University becoming the first ever device connected to the Internet back in 1982. The IoT potential has increased thanks to the availability of faster Internet services, new sensors, and technologies. A multitude of platforms for IoT development have appeared over the last few years, attracting major players. It is an exciting new trend that will surely become an important part of our lives in the next few years. Internet of Things is a relevant future trend in mobile, as expressed in the IoT resources blog category by our app developers. By 2020, the base of Internet of Things connected devices is set to reach a number between 6 and 30 billion, with a clear focus on consumer-oriented devices, especially smart homes and wearables. We are headed to a world where connected electronic devices are real, and new possibilities appear every day. From BLE (Bluetooth Low Energy) connected devices, home appliances, and cars, to home automation, any object that can connect via the Internet, and receive and send information to a control center can be part of the Internet of Things. Within the home automation sector we already have Alexa and Amazon Echo, and Google Home is slowly conquering everything, with its speakers outselling Echo during 2018’s first quarter. Virtual or voice assistants are also a helpful tool for the expansion of IoT. The improvements that voice assistants have experienced thanks to Machine Learning make the future of IoT very promising. Only time will tell if security issues (personal data storage, device hacking) will become a major threat or not. 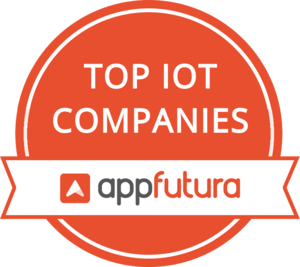 In the Internet of Things App Developers directory you’ll find about a thousand app development companies that are focused on IoT development, which is one of the most popular sectors nowadays. Browse through the different developers and choose the right company for your project based on their client reviews. Message them, call them or visit their website to ask for a quote, and don’t forget you can use our escrow system to make all the required payments in a secure way. On the other hand, you can also create your Internet of Things project and receive proposals from all the developers on our directory.